If you love iPhone you are surely going to love this news. iOS 7 was released in 3 months before and today finally the evad3rs team has released an untethered jailbreak for iPhone, iPad, and iPod devices running iOS 7.0 through iOS 7.0.4. The evasi0n installer is compatible with Windows, Mac OS X and Linux so no matter what operating system you’re on, you should be able to jailbreak your device. Jailbreaking is the procedure of modifying the iOS of your iPhone to remove the limitations imposed by Apple. This allows a user to access and install a lot of new applications, software and other similar content which otherwise are not made available to iPhone users through the Apple Store. The process is very simple, and within five minutes you can jailbreak your device. According to the instructions, iTunes must be installed if you’re running Windows and the only prerequisite is that the device should be running iOS 7.0.4. Team advice user to backup device data before using evasi0n tool. If something breaks, you'll always be able to recover your data. FAQ :- "Jailbreak is legal or not ? ", - Yes is legal, at least in the US, a rule was passed in July 2010 by the US government made it legal so whatever you are doing with your iPhone is completely legal. Once the installation will complete, the Cydia will appear on the home screen. 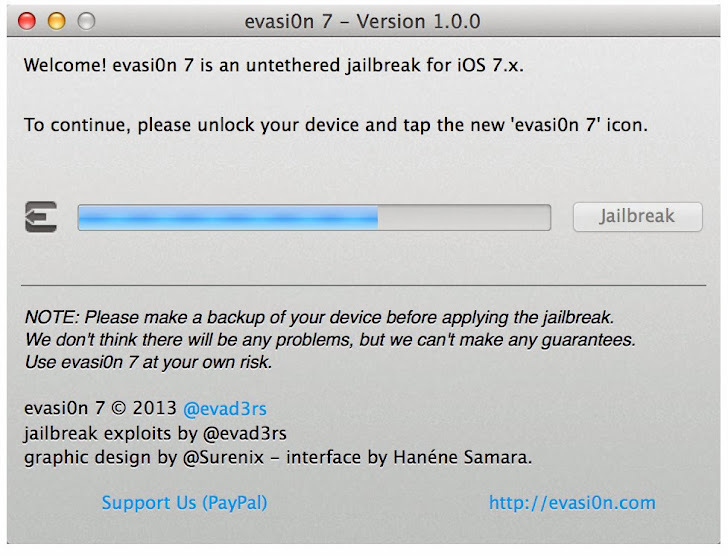 Update: The Evasi0n jailbreak comes bundled with a Chinese cracked app store known as the Taig in addition to the unofficial version of Cydia.